Washington, D.C., circa 1924. 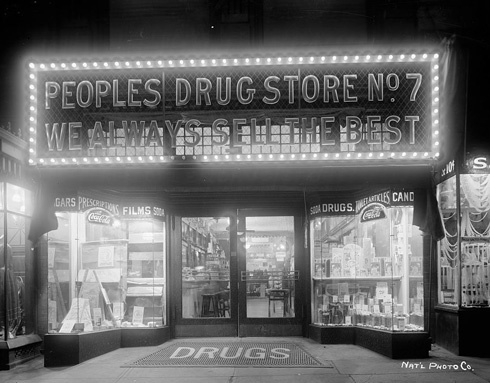 "People's Drug Store group, 11th & G Sts." Including one People's non-person. National Photo Co. glass negative. View full size. Submitted by MabelNormand on Sat, 05/05/2012 - 7:32pm. Which number store is this Peoples crew from? Any info would be greatly appreciated. Submitted by kirksjunque on Mon, 02/27/2012 - 6:35pm. The young lady at front left is sporting those earphones-of-hair that were dubbed "cootie garages" in the slang of the day. The book "Cheaper by the Dozen" does a great job of describing the generational turmoil brought on by the bobbed hair fashions of the day. As I understand it, this style enabled the young lady to have the shorter hair "look" without actually having her locks shorn (frequently at the barber shop---around all those men---- just not appropriate for a young lady to be in there). The hair was rolled up into these tufts seen here, a la Princess Leia. As the twenties roared on the bobbed hair won out. Likely this was due as much to the greater ease of care as it was to any negative connotations of the slang name. (And I have been informed that not everyone knows that cootie = lice, yet another colorful generational term on the scrap heap of history). Submitted by BdgBill on Mon, 02/27/2012 - 10:43am. 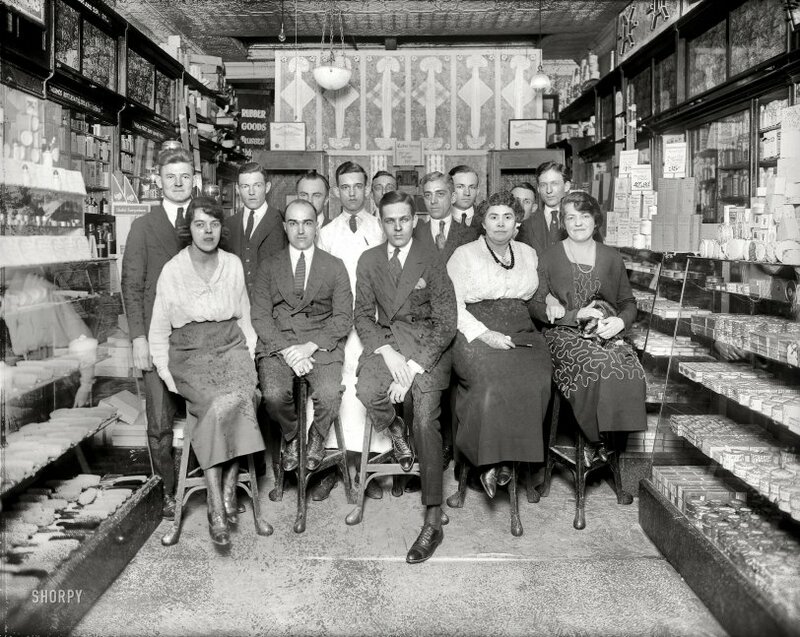 14 people to run a tiny (what looks like 700sq ft) drug store that was probably only open for 6 hours a day. I bet their are 24 hour, 10,000 sq ft Walgreen's that don't have that many employees today. Submitted by perpster on Sun, 02/26/2012 - 9:38pm. Six of the men in this photo look ear-ily related. Submitted by texas deb on Sun, 02/26/2012 - 6:57pm. Submitted by jimmylee42 on Sun, 02/26/2012 - 6:53pm. Thermos is still going strong today and it looks like this small store has given the bottles and fillers a fair amount of display space. Thermos was only 20 years old in 1924. Submitted by Savonarola on Sun, 02/26/2012 - 6:34pm. The Roaring Twenties saw Thermos become a household name; aviators were sure to pack one, they were great for an auto trip, and for the adult beverage they were more acceptable than hip flasks. Submitted by aenthal on Sun, 02/26/2012 - 5:55pm. They seem to have captured all 15 of their employees: the 14 humans and the feline who worked their rodent control department. Submitted by k2 on Sun, 02/26/2012 - 5:44pm. No broken noses for this bunch (looks like at least four in the 7th & K photo and at least one pair of matching non-aerodynamic ears). But the young lady in front makes me think they might want to check the laudanum and paregoric stocks. Submitted by kvenido on Sun, 02/26/2012 - 5:35pm. It's pretty hard to imagine anyone carefully perusing any pictures of ME (and/or wondering what's up with my bizarre clothes/make-up/hair etc.) but if they do, I hope I look a bit like the woman on the far right who sports both a warm smile and a nice kitty. That's not a bad way to go down in posterity. Submitted by Rute Boye on Sun, 02/26/2012 - 5:01pm. You need 'em, Peoples has 'em. Submitted by Hey Mark on Sun, 02/26/2012 - 4:52pm. Looks like Mrs. black necklace is holding the eyeliner pencil that she experimented on the guy sitting right next to her. Submitted by TimeAndAgainPhoto on Sun, 02/26/2012 - 4:44pm. Judging from these folks and the group from 7th and K, it looks like People's had a firm Affirmative Action For The Undead hiring policy. Submitted by JohansenNewman on Sun, 02/26/2012 - 4:13pm. Or is there an awful lot of eyebrow grooming going on, with both men and women in this picture? Not to mention some kohl under the eyes for Mr. Front and Center. Who said Keith Richards did it first? Not according to this picture. Wonderful shot. Wish I could shop those shelves.